The department of Caquetá, the country’s southern gateway to the Colombian Amazon, has been one of the focal points of the Colombian conflict. The historical presence of the guerrilla and of paramilitary groups, combined with a strong presence of the military in recent years, has seen the area turn into a geostrategic battlefield over the control of transport and of the land itself, which is particularly rich in natural resources and has large areas of illegal crops. The consequences for the civilian population are vast. Threats, murders, forced disappearances and displacements, confinement, and restrictions on movement are just some of the dangers that the inhabitants of Caquetá are faced with. In 2005, MSF started implementation of a mental health project to tend to the victims of the Colombian conflict and provide a service not being adequately supplied by government health structures. This report is based on data compiled from 5,064 patients who were provided clinical care by MSF from March 2005 to September 2009. However, the civilian population not only endures the violence caused by the armed conflict. It also faces additional violence on two different levels: the neglect and ineffectiveness of the institutions that ought to tend to them, as well as social silence and stigmatization. These three levels of violence have a serious impact on the mental health and the quality of life of the individuals and communities which are exposed in one way or another to the conflict. These multiple forms of violence are the atrocious reality that a large part of the people of Caquetá have to live with, making them victims of the conflict many times over. The consequences of this violence include a series of mental health disorders, both on an individual level and on family and community levels. This overwhelms the population’s coping mechanisms and causes severe emotional and psychological suffering which the authorities ought to respond to. Médecins Sans Frontières/Doctors Without Borders (MSF) has been working in the department of Caquetá since 1999. 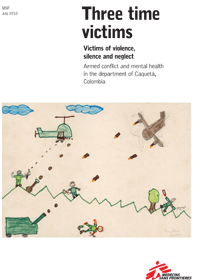 In 2005, MSF started implementation of a mental health project to tend to the victims of the Colombian conflict and provide a service not being adequately supplied by government health structures. This report is based on data compiled from 5,064 patients who were provided clinical care by MSF from March 2005 to September 2009. Sixty-five percent of the patients were female and 35 percent were male. Ages ranged from one to 89, although patients most commonly belonged to the 19- to 45-year age group. Additionally, 60 percent of the people were seen in Florencia, the capital of the department, and 40 percent were seen in rural areas. Through the statistical data collected and the accounts provided by its patients, MSF wishes to make known the suffering that the violence is causing among the population. The mental health profile recorded among our patients demonstrates the direct impact of the armed conflict on the mental health of the population, which the country’s mental health services fail to cover due to the extent of the problem. Finally, this report seeks to demonstrate that mental health services can indeed be provided in conflict situations, even with limited resources, and that they can effectively benefit patients.